The birth of Kylie Jenner's daughter Stormi Webster has brought her and her BFF Jordyn Woods closer together. The 20-year-old and the 21-year-old Keeping Up With the Kardashians star and cosmetics mogul have been besties for years. Jordyn had joined Kylie's family members in helping out after she gave birth to her and Travis Scott's daughter, their first child, in February. When asked how her friendship with Kylie has changed since Stormi was born, Jordyn told E! News exclusively, "I think it just has gotten better. It is a part of life and the process of growing up. I think it has been really great with her around now. Stormi is so sweet and so beautiful. I love hanging out with her all day." "She is just amazing," she added about the baby. "I'm obsessed." Jordyn made her comments at the launch of Kate Somerville's Retinol Vita C Power Serum on Friday. In July, Wood talked about how Kylie has changed since becoming a mom, saying, "I think just people grow and evolve every day and when you become a parent you have to keep learning and it's an experience and I have just seen her blossom and mature, so it's nice." During her interview with E! News on Friday, Jordyn also talked about her and Kylie's upcoming Jordyn Woods x Kylie Cosmetics makeup collaboration. "We have been trying to do this since she launched her company and we finally figured things out," she said. "It is coming out sometime next month...It must just be...on my 21st [birthday], maybe." Jordyn turns 21 on September 23. "When I met Kylie, I was a tomboy. 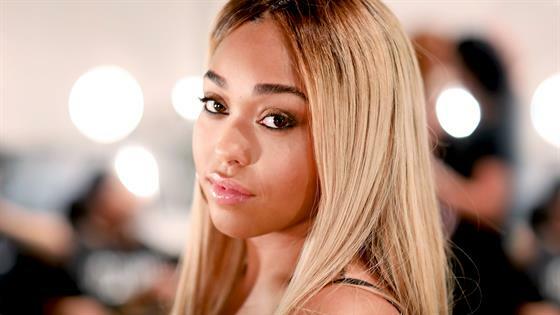 I didn't wear any makeup," Jordyn added. "I didn't wear hair extensions or anything. I saw them do it. And over time after watching Kylie put on makeup, I learned how to do it myself. Now, I really only trust myself to do my makeup." Watch Keeping Up With the Kardashians Sundays at 9/8c only on E!